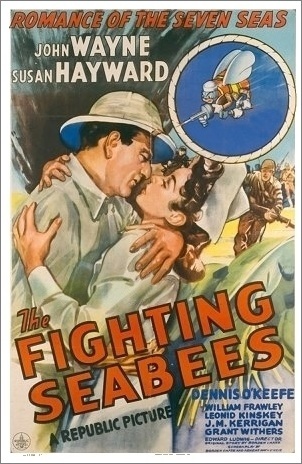 John Wayne’s 1944 movie ‘The Fighting Seabees’ depicts a fictionalized account of the creation of the Seabees. Building and construction of bases/airfields is given very little importance, with more of an emphasis on the love story between the two leads as well as the war against the Japanese. No quonset huts are seen in the entirety of the movie. However, the movie does provide insight into the Navy’s need for an armed construction force. The army had the Army Core of Engineers to build bases, roads, and bridges. But the Navy had no equivalent and with no construction force, crucial airfields and installations could not be built. After the Japanese attack on Pearl Harbour, it became apparent to Admiral Ben Moreell that the Navy needed their own version of the Army Core of Engineers. The Seabees or U.S. Naval Mobile Construction Battalion on March 19th 1942. Men were not drafted into the Seabees but volunteered or were recruited. Prospective Seabees were deemed fit for duty not based on physical health but on skills acquired through years of trade work. Men from carpentry, welding, masonry and mining backgrounds were sought after. Their skills were needed for building airfields, oil refilling stations, and bases. The Quonset hut was the standard building that the Seabees erected in both the Pacific and Atlantic. However, the tropical climate of the south Pacific posed problems for the corrugated steel of the typical hut. A hut made of wood and covered with a waterproof masonite board was used instead. The basic structure and setup remained the same. The flexible design of the Quonset hut allowed for easy adaptability to any climate. It is safe to assume that the Quonset hut was used as the basic building for most of these operations.